in heav’n the bells are ringing . . .
"Many of the most beloved holiday traditions involve bells — ringing to accompany carolers, playing seasonal melodies, and pealing out to summon celebrants to church services. Quebec City is part of a unique heritage, change-ringing, which dates back to the 1600s in England. Today, more than 6,000 bell towers around the world ring in this style." View rest of article published in the Quebec Chronicle-Telegraph (12.12.2012). Here in Quebec City, we have two towers with bells set for change-ringing - quite noteworthy, considering there are only seven such towers in all of Canada! I've been learning to ring them for the past six months, and this is unlike any other instrument I've known. These aren't the intricate melodic bells that ring from a carillon, nor are they the joyful riot of sound one expects from wedding bells. Instead, these bells are rung as if set to a metronome - one at a time, one after the next. Essentially, change-ringing bells are played in rounds, starting from the lightest ('treble') and ending with the heaviest ('tenor'). Rounds aren't very interesting for ringers or listeners, though. 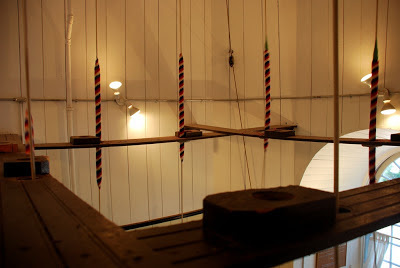 So, since the 1600s, ringers have been inventing complex patterns for the bells. With names like Queen's, Plain Bob Doubles, and Grandsire, the patterns look to the uninitiated like a knitting pattern written out on paper. The order of the bells changes with each round, so that any given bell may be one ahead or one behind during the next sequence. Melodies don't work because of physics. The momentum of the bells can only be adjusted slightly, meaning one bell can move ahead or behind one place, but no more than that, in any given round. Aside from being a double-tower city, the bells of Quebec are bilingual, too. Meaning, we keep with tradition, and all the calls, directions, and terms associated with the bells are said in English. However, most of the discussions, coaching, and socializing takes place in French. The aspect I find most intriguing is the location of the bells. They are installed sixty feet overhead, and our only connection to them is through that many feet of rope. You see, there are two sturdy ceilings between the ringers and the bells - while we pull, count our rhythms, and weave our patterns, we do it all 'blind.' 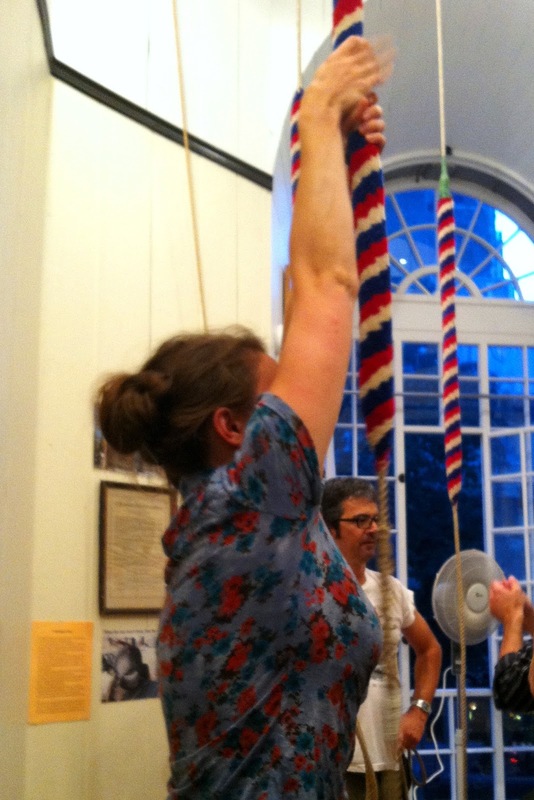 You cannot see the bells while ringing! 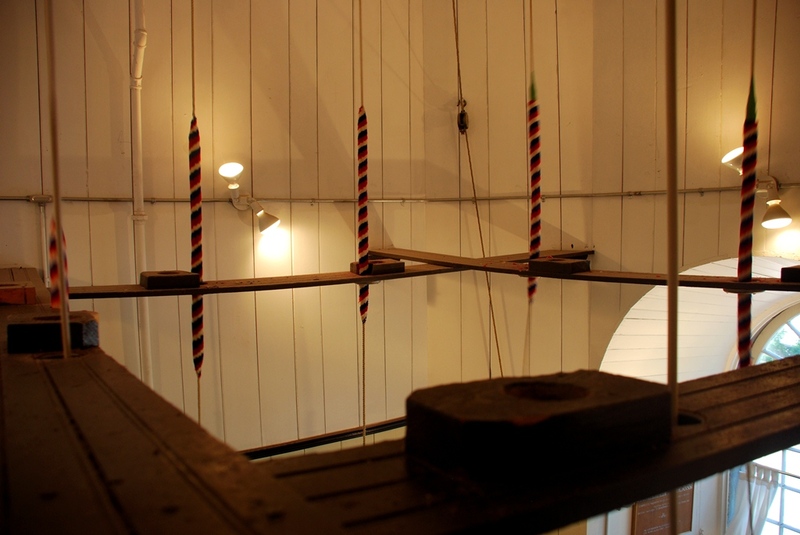 See the Queen's bells for a glimpse at change ringing bells in action. Learning to ring is more physical than musical. There are actually fitness benefits ascribed to it. Muscle memory is key in a way reminiscent of sports - one's posture, positioning of hands on the rope, timing, and strength of pulling are all fundamental to proper "metronom-ic" ringing. These bells swing nearly 360 degrees, and at the peak of each swing, the bell rings. The trick is to maintain exactly the right pressure and rhythm to ensure each stroke of the bell is at the same cadence. The physics and acoustics involved are fascinating. 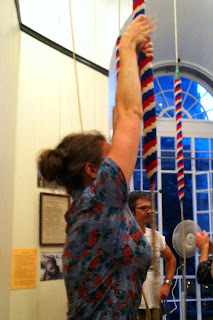 Once I improve to the point where I can ring a bell in rounds without falling out of order, and I can use both the end of the rope and the hand-hold region (called a sally) to 'stand' or stop the bell from ringing, I will graduate from a beginner to an actual member of the local guild of bell ringers. Though the bells we ring have been in place for almost 200 years, The Quebec City Guild of Change Ringers was established September 6, 1927. The local guild is part of the North American Guild of Change Ringers. Folks say, once you're able to handle a bell properly, a bell ringer receives a warm welcome in any city possessing a bell tower. I just read a Dec. issue of the QCT with the bell ringer story. t was really fun reading about various people in the bell program, which isn't included in the blog post. I liked the article, and it works well in combination with the post. I usually aim be a bit more 'official' in the paper than in the blog. This way, I can use the blog posts to provide additional background or personal insight that might not be appropriate in an article.